There are LCD TVs in all bedrooms and a 55' LCD in the living room, free wireless Wi-Fi in house. Free phone inside US. You do not have to worry about anything, just relax and enjoy your vacation. Just 35 miles from Orlando International Airport, Regal Palms Resort & SPA at Highlands Reserve is a gated community with a 24-hour frontdesk, sports pub broadcasting live events worldwide, restaurant, Frankie Farrells - restaurant and play ground, arcade, business center, meeting facilities, fitness center, and a large water park complete with waterslide, lazy river, spa and sunbathing terraces. There is a Spa and Health Club that offers an array of wellness, fitness, and beauty treatments. You will wish to come back year after year, and we are happy to accommodate your next many vacations. Regal Palms Resort is just a great place to have your vacation. NOTE: No Hen or Bachelor groups please! Also no Sports or school groups! This is a family holiday home only. Thank you. 2) Deposit $260 via PayPal two weeks prior to arrival and refunded less $10 handling charge 7 days after departure via PayPal as long as no damage reported. I am 71, semi-retired, but working as a self employed Flying Instructor. I live in Biggin Hill, just south of London UK, and I am married to Christina. We have two daughters, ages 24 and 21, and I have a daughter aged 40. We also own a holiday home in the Algarve in Portugal. I have visited Orlando several times, and did some of my US Licence flight training in Crystal River to the north of Tampa. I have always liked the idea of having a holiday home as an investment in Orlando, and my wife and I decided to purchase this property as an investment in March 2015, following a short visit to view a number of properties. We took it over from the existing Danish owners as an existing rental business, and have appointed management agents who specialise in properties at Regal Palms Resort. It is rented out for most of the year, allowing us to use it only out of season. We have previously stayed in Davenport, and love the area with its easy access to all the theme parks. The gated community of Regal Palms Resort offers everything for a family vacation in a secure location away from the bustle of Orlando itself, yet just a short drive away We are certain you will love staying in our Florida home and will absolutely love the very special resort facilities on offer. It is perfect for that special family vacation in Florida. We loved the comfortable feel of Regal Palms, with the wonderful clubhouse/restaurant with two pools, lazy river, water slide, and outdoor jaccuzi. There is literally everything for a perfect family holiday. With a large Publix supermarket just a few hundred yards away, and several restaurants within easy walking distance it was perfect for us. The house itself is perfectly located within the resort - away from the potential noise of the club and pool area, and yet within an easy 300 yard stroll. (some houses on the resort really need a car just to get to the pool area!) All this, but just a short drive from all that Orlando and Disney/Universal and other Florida theme parks have to offer. Well taken care of home. Easy folks to work with. Would definitely book with them again. Great location for the whole family. We stayed in this property in 2018 as well as 2019 and have booked for two months next year. This is a very spacious home that is clean and comfortable . Quiet neighbourhood with a short walk to the pool. The house was equipped with everything we needed to make our stay enjoyable. Thank you for your nice comments. Hope you had a good journey back home. We are so pleased you enjoyed your time in our Regal Palms home again, and we look forward to you staying with us next year. Great condo, close to Disney parks and restaurants. 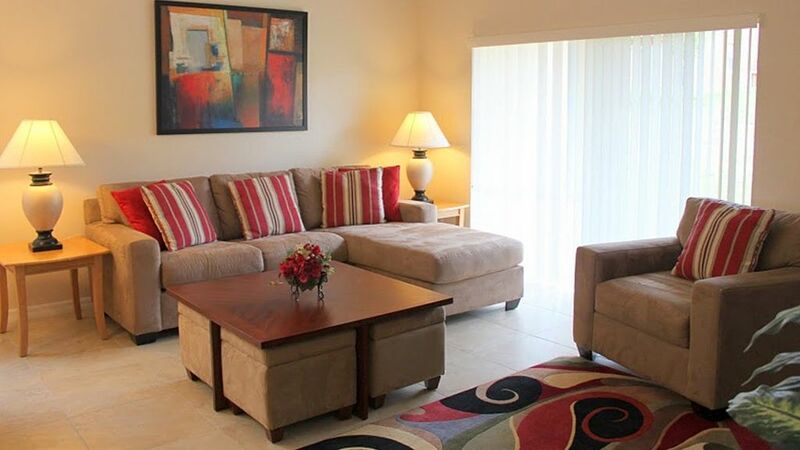 We enjoyed our stay in this condo as it is close to Disney Parks as well as to restaurants. Perfect for a large family or a couple smaller families. Quiet gated condominium complex with security 24/7. We did not utilize the pool area as we were busy with Disney parks and SeaWorld while we were there. The owners were great and took care of any concerns that we had right away. Thanks for those kind comments. We are so pleased you enjoyed your stay in our Florida home. We enjoyed having you as our guests and hope you will come and stay with us again should you return to Orlando for another vacation. Thank you Ramon for this great review - we are so pleased you enjoyed your stay in our Florida home, and thank you also for your nice email. i would give the vacation condo a 4 star rating. the condo was spacious enough for our large group, reasonably close to any places we wanted to visit. the resort itself had any ammenties we needed. on the negative side we found 2 issues. 2 of the 3 bathrooms had mold in them. all shower curtains had mold and needed to be clean. the kitchen was not stocked with enough cooking utensils [pots and pans ] to support a large group. Firstly, My apologies for the mould that was found on the shower curtains - that is not the standard that we expect our guests to find - this has been taken up with our local management agents to rectify without delay. We have also asked them to recheck the inventory of pots and pans as we had more than enough for a normal family home when we last inspected the property ourselves. Having said all that, we are pleased that you otherwise enjoyed your stay and gave us 4 stars. We hope these shortfalls will not put you off returning to stay with us again should you return to Orlando in the future. This home was perfect for my family! The owners were extremely attentive to all my needs. The house was clean, well kept, and located close enough to the pool to walk! We enjoyed our vacation and can’t wait to visit again soon! We are so pleased that you had a great vacation and liked our Florida home. Thank you for your review.